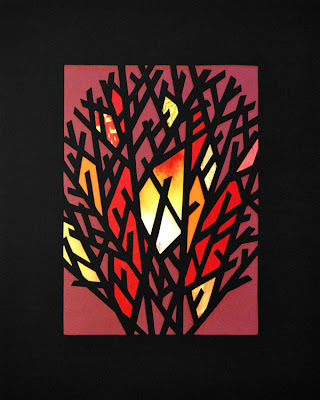 Last week I finished up this "Burning Bush." I've used comics textures sparingly here, and tried to build some real heat in the center of the bush. The flame burns, but does not consume. Now I just need to get these photographed better -- it's harder to convey the impact of the papers and colors on film (at least, for me). Great work. I have a burning bush tattoo idea that's similar. Do you have any work for sale? Thanks for your comment, Travis. I'm actually prepping for a show at the end of January, and all the work will be on sale. I also accept commissions (though not right now, cuz I only have so many hours in a day!!). The show is in Orange County, California - a bit of a schlep from NC, I'm afraid!